The Glendale Heights Oktoberfest was almost essentially Oktoberfest to a T. The tent, tables, atmosphere, food and they even had tableside servers. The only thing this Oktoberfest was missing was the music. My friend Adam and I went on Saturday, September 14th around 6:00pm. The parking for the event was more than ample. They utilized a large field next to the tent and there were a number of workers directing traffic and telling people where to park. 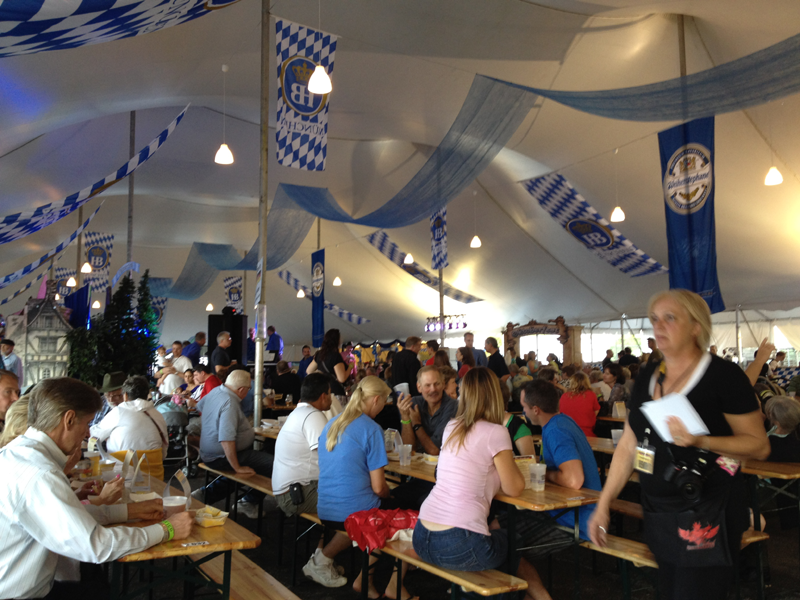 They had a really large tent with both indoor and outdoor seating on authentic biergarten tables! We were also lucky to have a $2 off admission coupon which was available on the website. The seating was very similar to that in Munich. The tables were beer garden style, open seating where ever you would like (except in VIP of course). We found a seat near the back because we knew two more people were showing up later. It took a little time to get our waiter but things were rather busy in the tent. Once we did get him we each ordered a beer with a souvenir glass stein. They had half-liter Hofbräu or Weihenstephan glasses for $15 that included the beer. Refills were $7 which was the same cost of a regular beer. 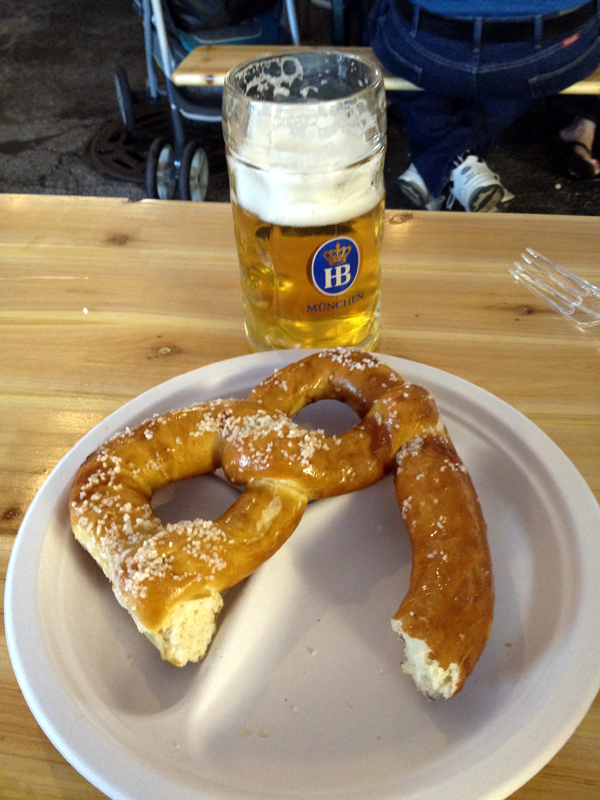 Along with the beer, we each bought a large Bavarian pretzel with mustard for $5 each. The beer was delicious but the pretzel could have been better. It was about the size of a regular dinner plate which I don’t consider to be “large” compared to the pretzels in Munich and it was over salted and dry. The mustard was good and did help with finishing the pretzel. Unfortunately, I didn’t have anything else to eat at the event but the menu was appealing. It included Pork Shank Dinner with sauerkraut and dumplings, Half Roasted Chicken Dinner with German potato salad and many other authentic Oktoberfest dishes. The food was provided by the Schnitzel Platz German restaurant off North Ave. in Glendale Heights. They also were the main sponsor and it showed because the decorations in the tent were superb. The whole atmosphere of the tent was very reminiscent of Oktoberfest in Munich and the waiters and waitresses walking around were also a very nice touch. The only real problem I had with the event was the music. When we showed up it seemed like the last German band just finished playing. Between sets they did play Oktoberfest music but then the rest of the bands for the night were nowhere close to Oktoberfest. The next band was a Jazz band then the headlining act was Rico, a band inspired by “innovative rock, soul, jazz, afro-Cuban, blues, funk, reggae and hip-hop pioneers.” The band was good but not right at all for the event. 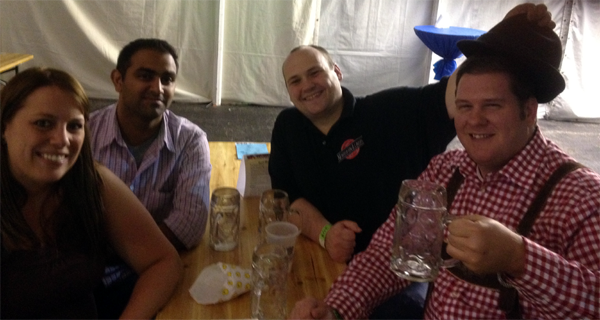 All in all, the event was a lot of fun and so far this year, has brought me the closest to Oktoberfest in Munich. I hope to come back next year to the same atmosphere with hopefully better music. 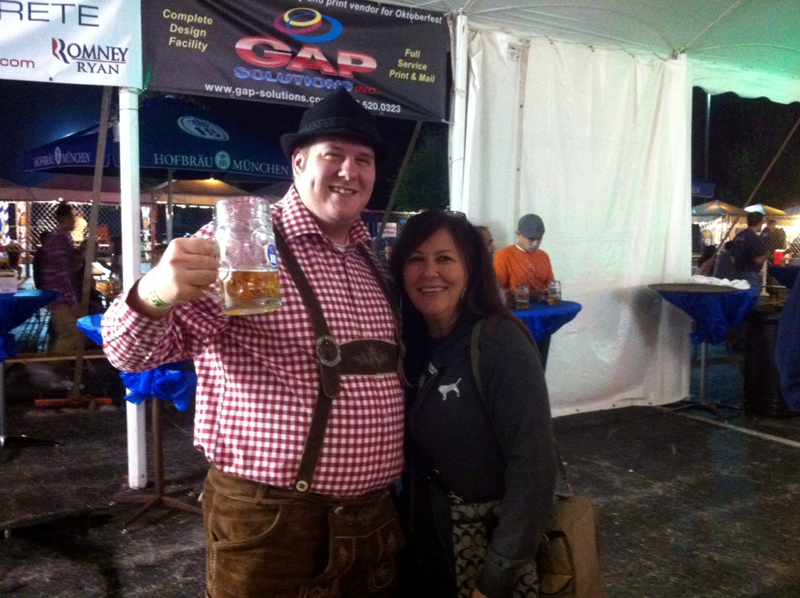 If that is the case then the Glendale Heights Oktoberfest will soon become my favorite Oktoberfest in the area.